Disabled comedians claimed the top two places on national television show Britain’s Got Talent. 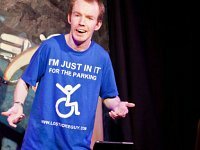 First prize in the 12th series of the ITV contest went to Lost Voice Guy, alias 37-year-old Lee Ridley, who has cerebral palsy and uses a voice synthesiser to perform his act. He is the first comedian to win the show, beating off the challenge from runner-up Robert White, who has Asperger’s Syndrome. Ever fancied getting up on stage and talking about your life? The BBC’s disability site Ouch! is offering people the chance to do just that,asking potential writers and performers to send them their stories on the theme of ‘Going Out’ – those voted the best will be given the chance to work with a top comedy script producer and perform it in front of an audience at the Edinburgh Fringe Festival in August.